Give your audio/video/gaming devices an eXtra AIR gap. Even though electrical devices are designed to operate at relatively high temperatures, other factors including ambient temperature, obstructions, dust, or other factors such as lack of air flow and poor ventilation can cause your device to have a shorter than expected life. As manufacturers continue to produce devices as cheaply as possible (this also applies for top of the range devices), then the lifetime of a device such as a DVR is expected to be limited. You may be of the opinion that it’s okay for your device to have a limited life, as you would upgrade the unit anyway after a few years. Technology does not stand still, with better units constantly being brought to market. The issue now though, is some devices have an expected life of just 6 months before they are made redundant, or worse break down. Why should you be forced to upgrade, when the device you were using does the job perfectly adequately? The processors inside your devices give off a significant amount of heat as a by product of intense processing power. Modern audio video devices can be compared to desk top computers, but in the good old days our ‘old fashioned’ desk top computer’s had plenty of room for processors etc, the cases had vents with sometimes 2 or 3 fans to keep everything cool. With the latest devices being much smaller, overheating is a common problem. The fact that modern electronic devices are a lot more compact than they used to be, and more powerful to boot! Understandably, most people do not appreciate the potential for a lot of heat generation or the problems this can cause. For those who can understand, the solution is usually far easier than initially thought. The number one reason why machines fail is due to over heating. 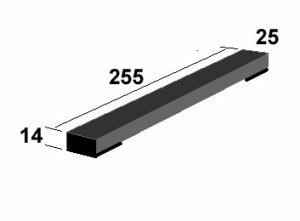 When two units placed on top of each other, the chance for heat dissipation is minimal. As can be seen in the thermal image, after three hours of operation, the temperature at the base of the Xbox is 50.9 degrees. With the introduction of the X Air spacer, a more useful air flow can be utilised, which enables the temperature to stay steadily around 23 degrees for the duration. These pictures taken after three hours of continuous operation show the difference in temperature with and without X-Air spacers. The thermal imaging camera quite easily picks up the heat points for each device. With the XBOX situated on top of the Echostar, you can see that heat generation at the base of the XBOX is amplified without the spacers. This is because reduced air circulation encourages the build up of hot air. In fact the effect is double as the heat generated from the Echostar adds to the heat from the XBOX, and with limited ventilation, the XBOX will get even hotter. This effect is known as Heat Amplification, and is a major cause of electrical device failure. Do you know anyone who has a DVR, or a games console, or a satellite receiver, or a DVD player, or a Broadband Router, or all of these devices? Are any of these devices stacked on top of each other? Are any of these devices placed neatly inside a cupboard under the t.v? Do you know anyone who has had a device ‘pack up’ for no apparent reason? Do you have a device that’s ‘on the blink’, or do you know someone in this predicament? If you have answered ‘yes’ to any of these questions, then you are not alone. Electronic devices are everywhere, practically every family household on the planet has at least one television. Most households have multiple tv connected devices. However, most people take them for granted, they assume that when they buy a product it is designed for life – designed for living. What the manufacturers do not tell you, is that the product is designed to operate in certain conditions. Manufacturers test their devices in clean, air conditioned laboratories, with more than adequate ventilation. As you can imagine, these conditions are anything but a typical ‘home’ environment. It’s no wonder they get hot and ‘pack up’. A Zmodo CCTV DVR unit will by nature be working non stop. This DVR device has the advantage of sitting neatly on X-AIR device spacers, which gives it an advantage when it comes to surrounding ambient air. 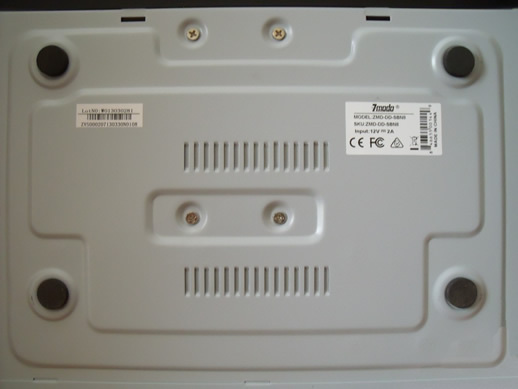 This shows the underneath of the Zmodo DVR unit. A DVR CCTV unit by nature of it’s design is meant to be left on permanently, with these devices operating until they fail. In the picture showing the underside, you can quite clearly see the vents. In addition, there are vents in the sides of the device. These vents are designed to give adequate cooling to the delicate circuitry and to the 1TB hard drive inside. In my opinion, the vents look a little on the inadequate side to allow sufficient cooling. Not only are the vents insufficient, but when you look at the clearance from the surface it is resting on to the base of the device, which is just a few millimeters, you can see that heat accumulation will easily build, especially if mounted on a wooden surface. This set up is typical of an electronic device, and will suffice as long as the device is operating in a cool, well ventilated room. Heat build up between two heat generating devices causes a magnifying effect known as Heat Amplification. X-AIR Spacers are the solution. By adding an extra air gap under your equipment there will be better air flow. fig.1 Shows a single device inside a cabinet without X-AIR spacers. Heat build up is significant because of the low clearance between the device and the floor of the cabinet. Heat reflects back into the device, plus the floor (depending on the material) will absorb some heat, and retain it. Heat will radiate from the source, and bounce off solid structures, just like light reflects off walls. What you are doing by placing your electrical device inside a cabinet, whether it is open fronted or closed via a door is insulating the enclosed space, so that heat generated will accumulate further. fig.2 Shows the effect that adding the X-AIR spacers can have. By simply raising the device an extra 14mm from the floor of the cabinet, the heat absorption of the floor is minimised, and extra air flow around the device can be much easier to achieve. Air flow is achieved simply by convection – warm air rises and given the space then flow will naturally occur to a certain degree. This will generally be enough for most situations. A USB fan can be added to aid further if higher temperatures are an issue. fig.3 Shows how the heat build up between two heat generating devices causes a magnifying effect known as ‘Heat Amplification‘. This happens because there is nowhere for the heat to go, so it accumulates as if the two units were as one. Unlike a heating device which would have a thermal regulator to switch off the heat once a given temperature is reached, the unit will get hotter and hotter. fig.4 Here we can see that with a distinct separation between the two devices, heat is able to dissipate into the surrounding air space, thus allowing the devices to reach and maintain a safe working temperature. The X-AIR spacer is constructed of high grade aluminium EN 755-9 rectangular tube, with Silicone rubber pads. There are plastic end caps fitted to the ends of the tube. For extra heat dissipation, you can flip off the plastic end caps. Aluminium has excellent heat dissipation properties. Silicone is one of the most heat resistant substances known to man. Free Shipping is available for UK residents. Inside the packaging, you will find two aluminium spacer bars, and four Silicone friction pads. As electronic devices can be different sizes, we provide the pads so that you can affix at the most appropriate place. The pads are self glued, and peel and stick to the underside of the spacers quite easily. Guarantee, if you feel that X-AIR spacers do not provide any benefit to your setup, then return the pack to us for a full refund. This offer is available for 12 months after purchase. Not too expensive so well worth buying. Fast efficient service well done.